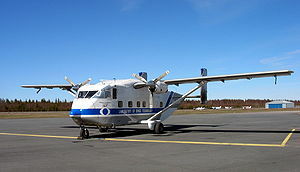 Picture - SC.7 Skyvan at Oulu Airport, Finland. The Skyvan is a 19-seater twin turboprop aircraft manufactured by Short Brothers of Belfast, Northern Ireland. It is used mainly for short-haul freight and skydiving. The Skyvan is a high wing twin engined all-metal monoplane with a high semi-cantilever tailplane with twin rudders. The first flight of the Skyvan, the Skyvan 1, was on 17 January 1963. The Shorts 330 and Shorts 360 are stretched model of the original SC-7 which were designed as regional airliners. In 1958, Shorts were approached by F.G. Miles Ltd (successor company to Miles Aircraft) who were seeking backing to produce a development of the H.D.M.106 Caravan design with a Hurel Dubois high aspect ratio wing. Shorts acquired the design and data gathered from trials of the Miles Aerovan based H.D.M.105 prototype. After evaluating the Miles proposal, Shorts rejected the Caravan. They developed their own design for a utility all-metal aircraft which was called the Short SC.7 Skyvan. It was popular with freight operators compared to other small aircraft because of its large rear door for loading and unloading freight. Its fuselage resembles the shape of a railroad boxcar for simplicity and efficiency. Construction started at Sydenham, Belfast in 1960 and the first flight of the prototype occurred on 17 January 1963, powered by two Continental piston engines. The prototype was re-engined with the intended Turbomeca Astazou turboprop engines later in 1963. The Skyvan is an all-metal, high wing monoplane, with a braced, high aspect ratio wing (similar to that used on Hurel-Dubois aircraft), and an unpressurised, square section fuselage. Production switched in 1968 to the Skyvan Series 3 aircraft, which replaced the Astazous with Garrett AiResearch TPE331 turboprops. A total of 153 Skyvans (plus the prototype) were produced by the time production ended in 1986. Skyvans served widely in both military and civilian operations, with the type remaining in service with a number of civilian operators, and in military service in Guyana and Oman. Picture - Invicta Aviation Skyvan on parachuting duties at the Cotswold Air Show. (2010). In 1982, two Skyvans of the Argentine Naval Prefecture participated in the Falklands War. Both aircraft were ferried to Port Stanley in April 1982. One aircraft was damaged by British naval gunfire on Stanley racecourse and did not fly again; it was finally destroyed by shellfire during British bombardments on the 12/13 June. The second aircraft was used at Pebble Island where it became bogged down in the soft ground and destroyed by British fire on 15 May 1982 (see Raid on Pebble Island). Skyvans are sometimes used for air to air photography and for skydiving operations. All built by Short in Belfast. Skyvan 1 : prototype, one built. 2 x Continental GTSIO-520 engines. Skyvan 1A : re-engined prototype. 2 x 388 kW (520 hp) Turbom�ca Astazou engines. Skyvan 2 : Astazou powered production. 8 series 2 produced. Skyvan 3A : higher gross weight version of Skyvan Series 3. Skyvan 3M : military transport version. It can be used for supply dropping, assault transport, dropping paratroops, troop transport, cargo transport, casualty evacuation, plus search and rescue missions. Skyvan 3M-200 : high gross weight version of Skyvan 3M (M-TOW 6,804 kg, 15,000 lb). Skyliner : deluxe all-passenger version. 121 Squadron, Republic of Singapore Air Force operated Skyvan 3M for Utility transport and Search-and-locate duties from 1973 to 1993. Lend lease for Parachute Regiment and Airborne Forces to fill gap of the C-130 Hercules. Jackson, A.J. British Civil Aircraft since 1919 (2nd edition). London: Putnam, 1974. ISBN 0-370-10014-X.